This week I’ve been experimenting with self-rising flour. It’s worked very well in muffins and biscuits, so this morning I decided to try it in some simple chocolate chip cookies. My prediction was that they would be cakey, and I was half right. They were slightly cakey, but very dense and had these great, brown, crispy edges. I don’t plan on making all future chocolate chip cookies with self rising flour, but I really did like how these turned out and thought the edges were kind of pretty. In a large mixing bowl, beat butter, salt and brown sugar until fluffy, scraping sides of bowl. Beat in egg and vanilla. By hand, stir in flour mixture until incorporated. Stir in chocolate chips. Chill the dough for at least one hour. Using a rounded tablespoon measure, scoop up dough to make balls a little over an inch in diameter. 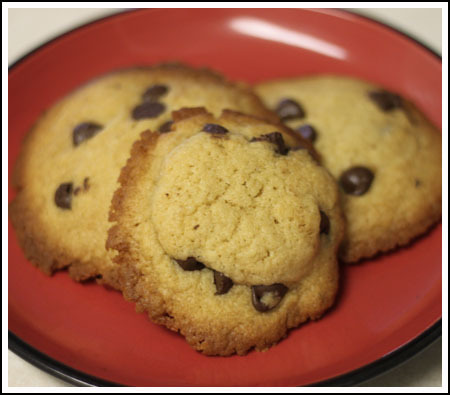 Place a few inches apart on an ungreased cookie sheet and bake for 12-15 minutes or until they appear done. After my cookies came out of the oven, I knew I failed because they looked very different from the chocolate chip cookies I made before. They were light-colored except brown on the edge, and they didn’t see to flatten out too much; I knew the center would still be quite doughy. But a day later, I finally realized that they are more like a soft cookie consistency, which if you let them sit for a day or two, actually turned out to be not too bad. Will definitely experiment again! If I ever purchase any self rising flour I hope I remember to try these. I guess if I’m going to make those muffins, I’ll have to buy some self rising flour, unless I want to make my own! I like the looks of the edges!